Like the rest of their outstanding cardio machines, Precor exercise bikes offer superior design to make your workout more enjoyable, comfortable, and effective. As such, they have become quite popular for home use, as the company offers a lower priced version of their club bikes for the residential market. If you're looking for something high end, Precor is a great place to start. Precor was founded in 1980 by industrial designer David Smith as Precision Corporation. From the start, Precor earned a reputation for quality and innovation in its cardio equipment line, and later in its strength training products. From launching the industry’s first cushioned treadmill in 1990, to introducing the highly regarded Elliptical Fitness Crosstrainer™ (EFX) in 1995 and the Adaptive Motion Trainer® (AMT) in 2007, this award-winning company has distinguished itself as a leader in residential and commercial fitness equipment. In 2002, Precor became a subsidiary of Amer Sports Corporation, the world’s largest sports equipment company, and the parent of the brands Atomic, Arc’Teryx, Mavic, Suunto, Salomon, and Wilson. As we mentioned, The Precor exercise bikes for home users are the exact same bikes used in fitness centers and health clubs around the world. These self-powered bikes require no plug-in to light up the console, and feature Precor’s patented SmartRate® Heart Rate System with handlebar grip sensors, and KOPS (Knee Over Pedal Spindle) biomechanics that put the user’s seat in an optimal position for more efficient pedaling. At any given time there are about a half dozen models to choose from, and Precor changes the featured ones on their website quite often. UPDATE: The company recently partnered up with Mad Dogg to create a new line of Spinner bikes. Check out our reviews here. This is closer to what you would find in the gym...a little more commercial grade and durable. You can choose a black or a silver frame, and it comes with 25 resistance levels just like the Assurance Series. You do get more workout programs though: 12 varied plus manual mode, including cross country, heart rate control, performance, random and intervals. You get grip and wireless heart rate monitoring, and an additional set of sensors on the top of the handles. The UBK 835 is slightly larger than the UBK 615 and about 5 pounds heavier. Both can accommodate up to a 350 lb. max weight capacity. Just like the RBK 615 vs UBK 615, the RBK 835 is very similar to the upright version, only with the step through design and ventilated seat. It's an additional $300 as well. The UBK 865 is an even more advanced version of the already top-notch UBK 835. It has more cushioned handlebars, easier seat adjustment and a 10 inch touch screen display rather than the simple LED on all other Precor exercise bikes. There's also an even wider range of workout program options, 17 in all, including various weight loss, fit and performance programs. It've over $2,000 more than the UBK 835, so it's really for those for whom money is no object. As with the rest of the series, the RBK 865 is the same as the UBK 865, only with a recumbent design and a slightly higher price tag. 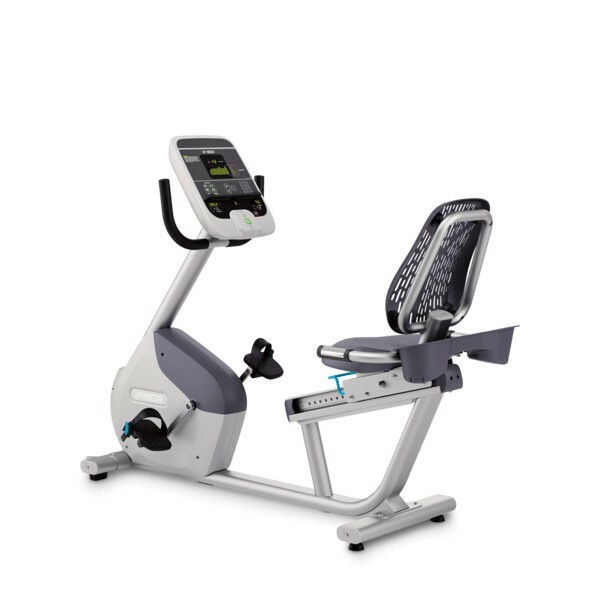 The company recently did away with the mid-level series, consisting of the UBK 815 Upright Bike with dual-side pedals, 14 level adjustments on the seat, two-stage drive system for quieter operation, advanced LED display and upgraded frame, and the RBK 815 Recumbent Bike, which shares features and capabilities of the UBK 815. All of the Precor exercise bikes are built to last, with very high end components and an attential to detail when it comes to design and biomechanics. All bikes have warranties that cover the frame for life, 5 years on the parts and wear items, and one-year in-home service coverage. This is one of the newer lines from Precor, but it looks as though it may have been discontinued as these bikes are not currently available on the site. This is the entry level model, if you can call it that at just under $2,500. It features three handlebar positions, 6 preset workouts, 25 resistance levels and customizable pedals. There is a bright, LED console with a numeric keypad, tactile keys, a Quick Start option and 12 different workout metrics that you can keep track of while you work out. The UBK 615 has touch as well as wireless heart rate monitoring for more accurate readings, and a SmartRate feature that tells you exactly what zone you are in: Fat Burn, Cardio or Peak. The recumbent version of the 615 is identical to the upright as far as the features and capabilities. The only difference is that it has a step through design and comfortable, ventilated seat that moves fore and aft depending on where you are most comfortable. It costs around $300 or so more than the UBK 615 on sale. Which Precor Exercise Bike Should You Choose? 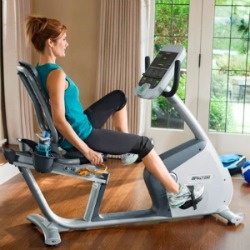 When it comes down to choosing a Precor exercise bike for your home, the first consideration should be your budget. Note that the UBK 615 will run you just under $2,500 and the UBK 865 will run you just under $6,000. So there is a big price difference there. The Assurance Series is perfectly fine for most home users, as you really don't need the extra durability and enhanced features of the Experience Series unless you a) have a lot of users on a daily basis or b) have an open budget. So we would recommend either the UBK 615 if you are looking for an upright bike or the RBK 615 if a recumbent bike is more your style. If money is no object take a look at one of the more advanced models in the Experience Series. And you can certainly buy with confidence when it comes to Precor. When you read any reviews on Precor exercise bikes, you will always find them judged to be superior machines that are built with quality components and the best workmanship in the business. Not only have these efforts won Precor numerous awards year after year from numerous sources, but their cardio machines are the top brand choice for many fitness center, spas, health clubs, and hotels around the world, including more than 500 Hilton Family hotels. If you want the best cardio equipment in your home gym, you can buy with confidence when you choose Precor. Here are some more in-depth reviews of the popular models. You can learn more about each one before you make your decision. Precor UBK 835 Upright - A self-powered commercial model that will help you stay motivated by providing an enjoyable and comfortable daily workout. Precor RBK 835 Recumbent - This recumbent exercise bike delivers one of the smoothest, quietest rides you can find anywhere. Whether it’s for rehab, cardio health or cross-training, it is a joy to own and use.